CAMARILLO, Calif., June 28, 2017—Semtech Corporation (Nasdaq: SMTC), a leading supplier of analog and mixed-signal semiconductors, today announced a new addition to its smart sensing solutions that enhances wireless connectivity by intelligently controlling the radio frequency (RF) power in connected devices including smart phones, tablets and wearables. Specific Absorption Rate (SAR) is the measure of RF power that is radiated into the human body when in close proximity to a connected device. 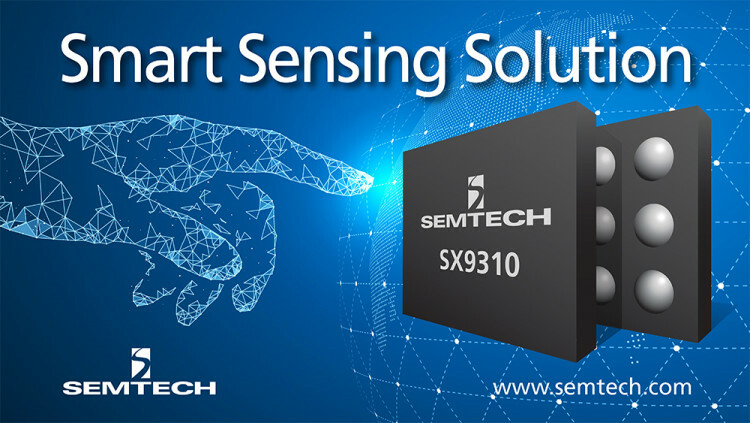 Aimed at the increasing demands of more powerful radios in today’s mobile devices and to comply with the more stringent worldwide safety regulation, Semtech’s SX9310 smart sensor enables smartphone and tablet manufacturers to selectively reduce the RF power when in close proximity to the human body and protects its user from potentially harmful RF exposure. The solution also maintains optimum network connectivity and throughput in other normal usage situations. The SX9310 product (order code: SX9310ICSTRT) is available immediately in production quantities and is priced at $1.14 each in 100-1,000 piece lots. Semtech offers comprehensive design assistance, including field- and factory-based support. Data sheets, volume pricing, and delivery quotes, as well as evaluation kits and samples are available at www.semtech.com/info. Semtech’s Smart Sensing Solutions features best in-class sensitivity for optimal human presence detection allowing electronics manufacturers to comply with worldwide Specific Absorption Rate (SAR) control. The ultra-small, feature-rich sensing solutions are used to reduce and control radio frequency (RF) emission power in the presence of a human body, enabling significant performance advantages for manufacturers of electronic devices with electro-magnetic radiation sources to meet stringent emission regulations criteria. The sensors are optimized for a wide range of battery-powered, portable applications such as smart phones, wearables, tablets, GPS, portable computers, handheld gaming devices, and other consumer electronics. All statements contained herein that are not statements of historical fact, including statements that use the words “aimed at,” or other similar words or expressions, that describe Semtech Corporation’s or its management’s future plans, objectives or goals are “forward-looking statements” and are made pursuant to the Safe-Harbor provisions of the Private Securities Litigation Reform Act of 1995, as amended. Such forward-looking statements involve known and unknown risks, uncertainties and other factors that could cause the actual results of Semtech Corporation to be materially different from the historical results and/or from any future results or outcomes expressed or implied by such forward-looking statements. Such factors are further addressed in Semtech Corporation’s annual and quarterly reports, and in other documents or reports, filed with the Securities and Exchange Commission (www.sec.gov) including, without limitation, information under the captions “Management's Discussion and Analysis of Financial Condition and Results of Operations” and “Risk Factors.” Semtech Corporation assumes no obligation to update any forward-looking statements in order to reflect events or circumstances that may arise after the date of this release, except as required by law.Semtech and the Semtech logo are registered trademarks or service marks, or trademarks or service marks, of Semtech Corporation and/or its affiliates.